A tale of two councils: Will they ever stand alone again? I thought about this song by the legendary Joni Mitchell the other day as I was driving around a parking lot trying to find a space to attend a public inquiry into the proposed merger of two councils in Sydney’s north, Ku-ring-gai and Hornsby. The meeting was held at the Pymble Golf Club in St Ives, and there was no access at the venue to public transport so everybody had to drive or get a taxi, possibly a Big Yellow Taxi like the one in Joni Mitchell’s song. It took 20 minutes to find the St Ives Village parking lot, and ten minutes to find a space. St Ives isn’t exactly paradise but it was much nicer 40 years ago before the developers reigned supreme. The golf club had no parking space for its members, so they closed the gates, even on drivers with disabled stickers. The Friends of Ku-ring-gai Environment (FOKE) president, Kathy Cowley, said: “The State Government apparently did not inform the club what this meeting was about. They were very secretive.” The government organisers said no attendees were locked out or turned away from the meeting. Yes, but it took us a long time to get there! 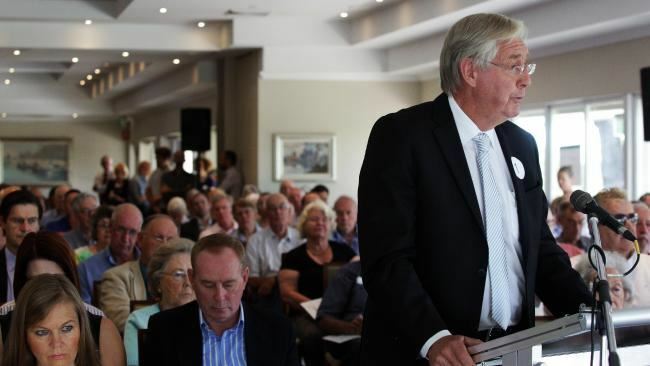 Although a vast majority of speakers were opposed to the amalgamation, a commercial property owner said dealing with the Ku-ring gai Council was impossible: “Never once have my calls been returned. I find them very good about telling me what I can’t do, but little or no help telling me what I can do.” Others, including me, said they didn’t have any problems with the council. Mike Gooley, a Ku-ring-gai resident for 45 years, said: “The Baird government has betrayed the people of Ku-ring-gai … This is just a power play. The less councils there are, the more power they have.” Many other residents echoed those remarks. FOKE’s Kathy Cowley said four generations of her family have grown up and lived in Ku-ring-gai. She has been a long-time Ku-ring-gai activist, fighting to preserve the region’s heritage and beauty. She claimed residents have been lied to: the KPMG report on the proposed merger was full of flaws, with the government not allowing access to the complete study. “This is not about people and the local community, it’s about the government streamlining things for planners and developers and taking away what little voice the community has left,” she said. Given those lies, Kathy Cowley called for a plebiscite to allow the residents to vote on whether the merger should go ahead. 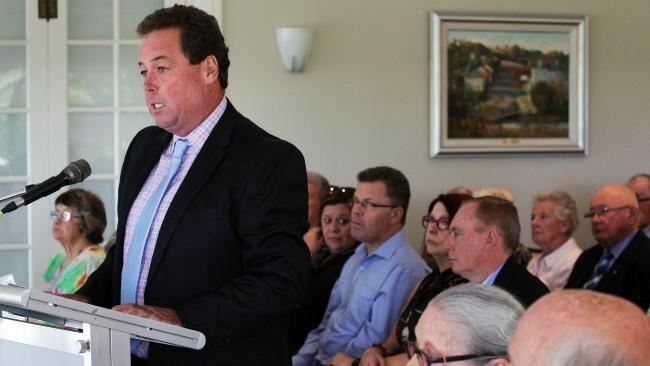 There was another session of the inquiry at the Pymble Golf Club later that night, which was addressed by Ku-ring-gai mayor, Cheryl Szatow, who had a video presentation, including photos of all the awards won by the council – yet a council not fit to stand alone. The one the mayor and the general manager are proudest of is the 2014 Bluett Award for Excellence in Local Government. Here is her presentation(it’s large). If that happens, it will be one of the biggest political upsets since John Howard lost the election and his seat in 2007. But if Gary West was listening closely to all the submissions and considering them, he would have to recommend the proposed merger should not go ahead, or at least recommend a referendum to let the people have their say. There were quite a few Liberals at the public inquiry who said they wouldn’t vote for the Baird Government if the proposed merger was adopted. Mr Baird, are you listening? One of those attending today is councillor and former mayor of Woollahra, Andrew Petrie. You think your buns are a-twist? He’s ropeable. Our other mate of that ilk is currently fixing the roof in his Yorkshire pile. Thanks your comment, Mac. Was Andrew there yesterday? I don’t remember meeting him. And thanks for organising the event. As you said, it wasn’t the greatest Super Bowl, but a pleasant way to spend the late morning and early afternoon, thanks to our excellent host!